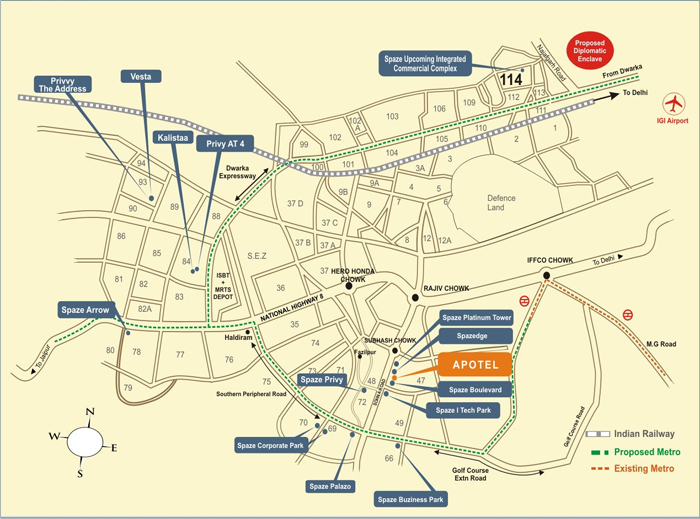 Spaze Apotel Sector 47 Sohna Road Gurgaon is a new commercial project launched by Spaze Developers. Spaze Apotel offered luxury Service Apartments. These fully furnished service apartments located at Sohna road are planned on 3 floors where there are separate drop off points for service apartment and retail. Concierge desk, housekeeping, fitness, restaurant, Ample parking space in 2 levels of parking and covetous location are some of the main highlights of the project. Taking care of every single need from the smallest from restaurant reservations to ordering flowers, the project offers it all. Hence, it is an awesome chance for small business owners to come and invest in this retail space or service apartment so that they can get all works done easily. Hence, come and enjoy the luxury of your own work space. Also, people investing in it can great huge returns in future due to the booming up property prices every day. Ideally suited for Apartment Owners looking for Luxury with a blend of both the worlds – Premium facilities and services, with extra spaciousness and personalized feeling of being in your own home. Excellent Long Term Income Option. Located on Sohna Road, Sector 47, a perfect opportunity at an envious location and swankiest commercial address in the heart of Gurgaon. Surrounding catchments includes – premium commercial offices and retail spaces of Spaze and other developers on Sohna Road. The Gurgaon-Sohna Road is proposed to be widened to six lanes making it the next investment destination. Multi Cuisine Restaurant, Swimming Pool, Gymnasium. Sohna Road after witnessing the growth of residential development would see the next boom in commercial development, of the kind seen on the MG road. The developing area is well connected to NH-8, Golf Course Extension Road, SPR, upcoming Kundli-Manesar-Palwal Expressway and Airport; also, it has excellent connectivity with Gurgaon and the NCR through the Metro line. Sohna Road enjoys a niche position in the realty market. It is expected that in the near future, the place will see a capital appreciation of around 25-30 % depending on individual projects and locations. Retailers like Shoppers Stop, Big Bazaar, Walmart etc. have anticipated the potential opportunity by establishing their presence on Sohna Road. Presence of Companies like Capgemini, Aircel, Yamaha, Regus, etc. legitimitize the above mentioned facts about Sohna Road. Spaze is a delivery-oriented company with a vision to create and deliver high quality projects on-time and garner utmost customer satisfaction. Spaze is committed to strive for excellence and transformation in all avenues of real estate. It is a technology driven enterprise with a constant endeavor to set new milestones in real estate development activities.